“Rhyme & Reason: My Life in Poems” from Christian Faith Publishing author Ilene Goff Kaufmann is a series of poems that show the importance of love, family and faith in overcoming personal obstacles. 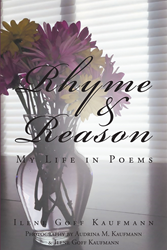 “Rhyme & Reason: My Life in Poems”: is a compilation of poems concerning faith and family. “Rhyme & Reason: My Life in Poems” is the creation of published author, Ilene Goff Kaufmann, a single parent of three has experienced a great deal of joy in life, however, it hasn’t been without hardship that the author has overcome with faith, family and the love that comes from them. “Look inside. Who can it be? My own reflection of what people see. On the surface so unbelievably strong. No one could imagine how much has gone wrong. Although, it’s what they feel. And the scars deep within, outwardly fade away. Along with His love and direction, He wants us to live. Published by Christian Faith Publishing, Ilene Goff Kaufmann’s new book is a series of poems that share both personal stories and stories of people in the author’s life. Through these writings the author finds happiness in both the high and low points in order to help others to do the same. In this series of poems the author tells both her personal story and that of those close to her as therapeutic exercises, publishing them so others may experience the same healing. With works covering a wide range of topics and emotion these poems can bring comfort in times of joy and sorrow. View a synopsis of “Rhyme & Reason: My Life in Poems” on YouTube. Consumers can purchase “Rhyme & Reason: My Life in Poems” at traditional brick & mortar bookstores, or online at Amazon.com, Apple iTunes store, Kobo or Barnes and Noble. For additional information or inquiries about “Rhyme & Reason: My Life in Poems”, contact the Christian Faith Publishing media department at 866-554-0919.